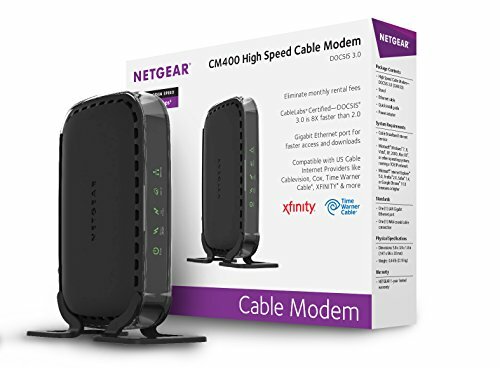 With the NetGear N300 Wi-Fi DOCSIS 3.0 Cable Modem Router (C3000), you can enjoy the new, faster speeds cable providers offer without having to take up their cable modem rental fees. Your modem and router are the single most important devices in your network. And today, with internet connection speeds becoming faster and faster as internet needs increase, it’s essential you install quality devices. A below par router or modem may throttle your speed preventing you from fully utilizing your subscription. Now we will present you NetGear N300 review which will show you all there is to know about this modem. The NetGear C3000 is one of the top cable modem and Wi-Fi router combo devices on the market today. The device is equipped with the DOCSIS 3.0 capabilities – a technology that many service providers are upgrading to. The N300 delivers great Wi-Fi speeds and range the range able to cover your entire home and even extend to the garage. The modem router is a great device for those people who would rather have a single networking device than a separate modem and router. It is easier to configure simplifying the setup process and helps users avoid modem router compatibility issues. The N300 comes loaded with many useful features including the NetGear Genie App which enables you to easily set up and manage your network. Fast WiFi Speeds—N300 WiFi for up to 300Mbps. Next generation DOCSIS 3.0 technology is 8x faster than DOCSIS 2.0. Cable Internet speeds up to 340 Mbps — 8 downstream and 4 upstream channels. Two Gigabit Ethernet Ports for fast wired connections. USB port to wirelessly share your hard drive. Fast self-activation for XFINITY customers. Gigabit Ethernet ports for fast wired connections. The ARRIS SURFboard SBG6580 is similar to the C3000 is so many ways. The device has a DOCSIS 3.0 Cable Modem and is capable of download speeds up to 343 Mbps and Wi-Fi speeds up to 300 Mbps per band. Unlike the NetGear C3000, the SBG6580 is an N600 WiFi router and it’s slightly more expensive. The TP-Link AC1750 provides much faster internet and has 2.4 GHz or 5 GHz bands, letting you run all your devices at maximum speed. The device features IP-based Bandwidth Control making it easier for you to manage the bandwidth of individual devices connected to the router. Its excellent resource sharing features and remote access capabilities make the modem router comparable to the NetGear C3000. However, it doesn’t represent as much value for money as the C3000. The NetGear AC1900 is a much more powerful device and has the features to match from an excellent range of full QoS and VPN capabilities. It also comes equipped with simultaneous Dual Band which doubles bandwidth and reduces WiFi interference for better connections. In addition, the modem router features high-powered amplifiers and antennas to help extend WiFi coverage throughout large homes and even backyards. However, to the average user, the router can be a little complicating to configure and the price tag can also be discouraging. However, if you are looking for a top-tier router, the AC1900 is a good option. Be sure to finish reading the Netgear N300 review first. The NetGear C3000 offers great speeds for faster downloads, Internet gaming, & HD streaming. Its range is likewise impressive but if you are you in a very large house this might not be the router for you. The NetGear C3000 provides users with secure WiFi connection thanks to its advanced WPA/WPA2 encryptions. Not only that, but you will also be able to set up parental controls for all your connected devices as well as separate and secure access for guests. The C3000 allows you to wirelessly access and share USB hard drives via USB ports. Even better, the router supports DLNA enabling you to find and play media on DLNA TVs and game consoles. You can watch a movie from your laptop on your TV, play music from your smartphone on your stereo and more. The NetGear C3000 CableLabs® DOCSIS® 3.0 Certified to work with U.S. cable Internet providers like XFINITY® from Comcast, Spectrum, Cox, Cablevision and more. However, it is not compatible with Cable bundled voice services. The NetGear C3000 modem router combo comes packed with an Ethernet cable, a quick installation guide, and a power adapter. The C3000 comes loaded with many useful features including the NetGear Genie App which enables you to easily set up and manage your network. The device comes with a reliable 2-year warranty and supports speeds of up to 300 Mbps thanks to its use of DOCSIS 3.0 technology which is up to 8 times faster than the traditional DOCSIS 2.0. The NETGEAR C3000 provides a wide set of functions and both the functionalities of a modem and router all in a single device. It’s top strength is its value for money. The C3000 can transform your home WiFi experience enabling you to enjoy the new, faster speeds cable providers are offering without taking on their cable modem rental fees. If you are in the market for a cable modem combo, then look no further than the C3000. You will enjoy a reliable high-speed connection without having to spend a ton of money.